Oh the weather outside is frightful and the fire is sooo delightful, when there’s simply no place to go… Oh, who put this massive ice wall outside of my house? Yes, that’s right, we’re looking at the Top 10 Ice Moves & Attacks this week, a very specific kind of attack. The only rules we have for this is that it has to be the actual ability that is ice. It needn’t be aggressive, but the user needs to have been able to manipulate ice to some capacity. Therefore, we won’t be allowing a weapon that’s made of ice, unless it requires them to maintain its iciness. FREEZE! You need to cool off… Er, no more puns. Let’s get on with this list. 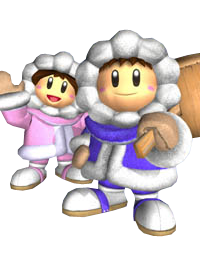 Notoriously cute, the Ice Climbers are a duo of eskimos who have teeny tiny little hammers in their hands. Named Popo (in blue) and Nana (in pink), they come from a game released back in the mid 80s simply called Ice Climber. Normally, you’d play as Popo, with Nana being controlled by the CPU – and in Smash Bros, this is no different. You control Popo, with Nana mimicking Popo’s actions. They make this list, but only just, as their ultimate ability in Smash Bros. is to summon a huge mountain of ice. When their opponents touch it, they can freeze up completely, becoming immobilised and being moved around by physics alone. Their ability however is all they really have going for them as they are by far one of, if not the hardest character to learn in the game. Nevermind little Eskimos, you’re still amongst the cutest characters in game. Pretty much a must have card for any blue or blue mixture deck. If you need to buy yourself some time to drop some cruel trick on your opponent, want to give them pause for thought when deciding whether or not to attack, or want them to be left wide open while you slip past their big guns, there is no reason not to want a wall of frost in between you and them. Crazy low cost, high toughness, and freezes any creature that touches it. Only one MtG card in the game is more useful and/or iconic, the indestructible (and flying) Fog Bank, but that barely needs a whif of damage before it’s dispersed. The Wall of Ice is not only one hell of a nuisance for your enemies, they’re also tough to shift. So sit back, relax behind your freezing fortress, and counter every attempt to pull it down with all that mana you’ve left untapped. 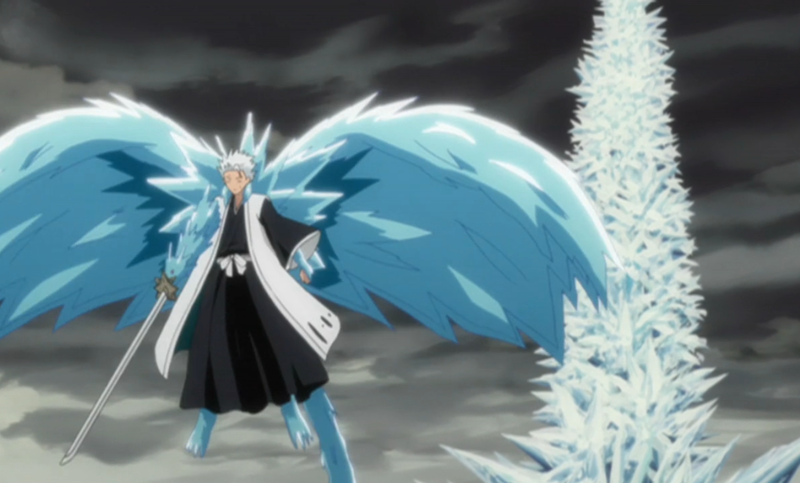 As captain of the 10th brigade, Toshiro Hitsugaya is in possession of one of the most devastatingly powerful Zanpakuto in all of Soul Society. In the sword’s final released form – Daiguren Hyorinmaru/Grand Crimson Lotus Ice Ring – the sword forms a kind of armour formed of ice, in the shape of a dragon, sculpted around him. 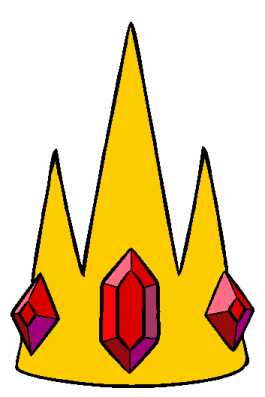 This in itself would be awesome enough, but it’s still technically an item, not a power. Hyoten Hyakkaso is a power only available to Daiguren Hyorinmaru. Probably the most iconic Mage move bar for the mighty powerful Pyroblast, Ice Block is a highly defensive move, allowing the Mage chance to get some much needed survivability. This is a move mostly used in Player vs Player combat in World of Warcraft, Ice Block is best used when you can get some backup from other players on your team, so you can then release yourself back into the middle of a group fight. 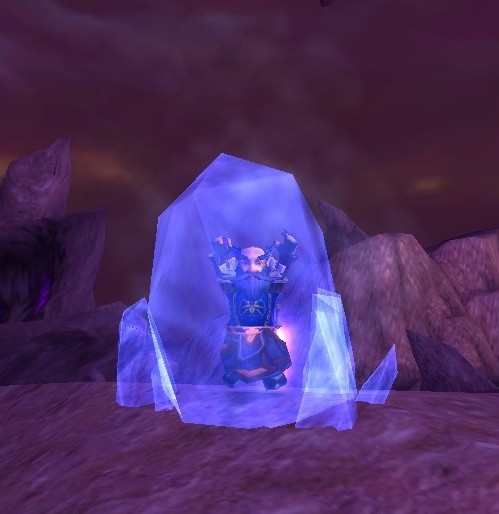 However, Ice Block has been in more than just World of Warcraft; it’s been around in Warcraft lore for a very long time. It’s by far the most important survivability move a Mage can have. Still, it was later ‘replaced’ due to talents, but it’s still in game, so don’t worry fans of Vanilla! Let me be honest; I didn’t see this coming myself. However, when we were considering the ice moves and attacks, this was actually a much improved version of Wall of Frost from Magic: the Gathering, simply because it’s portable! 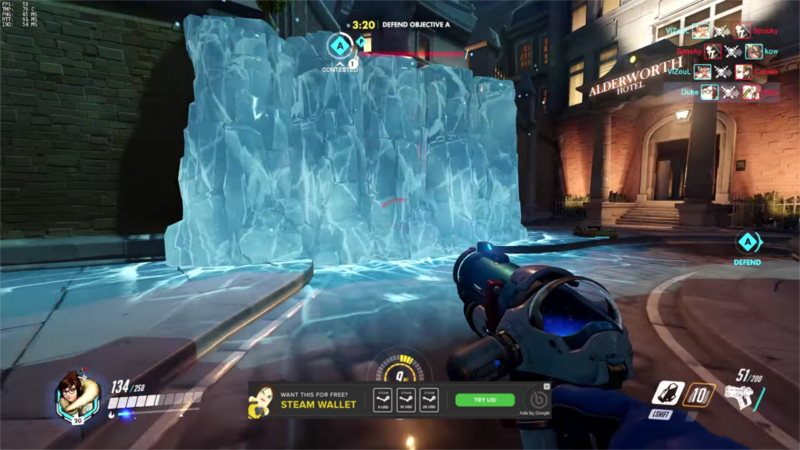 It’s a great big wall in the way of the opponent’s, blocking Mei and her teammates from incoming pain. It must be great to hide behind a wall of frost. Mei dresses in warm clothing, but she’s not an Eskimo. Nope, she’s Chinese in nationality, but it seems she learned how to be cold as ice (HAH) in the process. Her Ice Wall has 5 pillars, each with its own 500 health. To be fair; that’s a lot of health for a basic wall that can be put up anywhere. Lasting for 4.5 seconds, this is a very strategic support ability which can change the pace of a game. Oh we had a lot to choose from here. Actually it came down to two of the best ice-moves from Gen 1, but while Aurora Beam is beautiful, clever, and has rather nice lingering effects, Blizzard is so much more iconic, and frankly it was the first move to spring to mind when we even considered the list. Incredible power, high accuracy (because you can’t outrun the storm!!!) and a chance to freeze your opponent where they stand, it’s about as icy as you can get. In Red/Blue versions, blizzard is surprisingly only available to two pokemon, Jynx and Arcticuno. It has only been out-weighed by a couple of ice-moves from Gen 5, and has long been the crown jewel of an ice-type’s moveset, and is a great TM to add to your high-powered team members. One-liners and Arnold’s performance aside, Mr. Freeze has one of the most powerful ice-manipulation weapons I think I’ve just about ever seen. He just misses out on our top 3, to which we have some real crazy abilities, however this gun is elegant in its simplicity. Able to freeze an opponent completely, the ice gun is one weapon you do not want to get on the wrong side of. Sheesh, talk about giving your enemy the cold shoulder! X-Men founding member Bobby Drake’s ability to turn water vapours into solid blocks of ice is fairly well documented, and his distinctive power to change his entire form into ice. By and large he does this by slowing the vibrations of water molecules to reduce them to freezing temperature. It’s a rather useful skill, to be sure, but lesser known fact is that Bobby is reducing the vibration of molecules to a complete stop. The universe strives to reach equilibrium, ending all energy and motion and reaching a state of absolute zero, a terrible expanse of darkness, nothingness. Now, Iceman’s ability can accelerate the process in its own little way, but at his peak of power he can actually bring about the total heat death of the universe, classifying him as an Omega Level mutant. A mutant capable of bringing about the end. Before I start this one, please do watch the above video. No, no, seriously – I’ll wait right here. You go on now. Okay, has your laugh-tank been depleted? Great, let’s continue. Ice Form is a rather powerful shout in the smash hit, The Elder Scrolls V: Skyrim. You assume the role of the Dragonborn, a powerful entity who is able to speak in the language of dragons. Your role is to go and kill the dragons that have returned, take their souls and use their souls as a fuel to power your Shouts. Of course, there’s a bit more story to it, but that’s the jist of what being Dragonborn is about. Ice Form is one of these shouts. You shout at your enemy until their frozen, however this is where the move stops being a cool move. It crystalises into something that breaks the game in the funniest of ways. Well, breaks enemies and yourself in the weirdest way anyway. If Ice Form is shouted on you or an opponent, the body hits the ground in a bizarre way… And the game can’t physics any more. It forgets how gravity works and it thinks that you’re going to go on a jet-speed flying trip around the universe. Because, y’know, Bethesda Quality? (We do love you, Bethesda. No harm meant~) Oh and if you want one more video, check out the above. Whether Sub Zero is the more popular MK character than Scorpion, that’s another article in itself. However, let us discuss one of his more potent and versatile moves, a statue of himself made of solid ice. If your opponent so much as touches the clone they become flash-frozen, leaving them wide open for a follow up attack, but so what? They can just move around it, right? 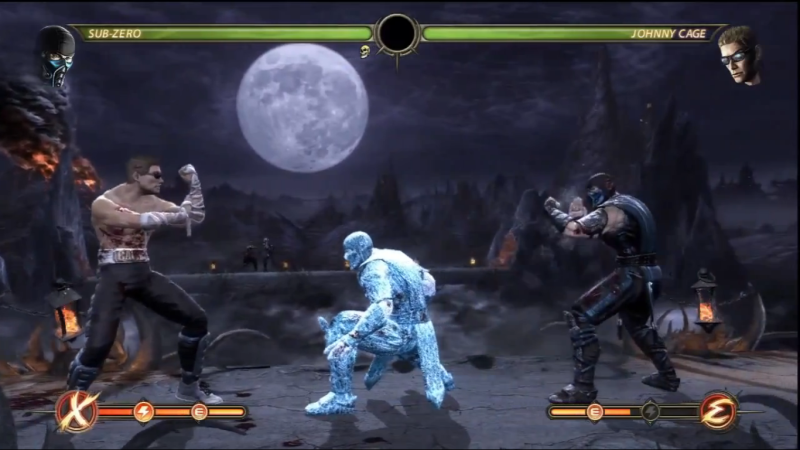 Well Sub Zero can actually throw the frosty figuring straight at his enemies, making it far harder to simply side-step without getting frozen. If Sub Zero has a clone out and suffers a deadly injury? No worries, you were beating up the clone this whole time and I was over here staying really still. While some may feel the ice puddle is more memorable, or the tombstone teleport looked cooler, I say that leaving a perfect copy of your body that’s cold enough to freeze a human being fully on mere contact is too cool to pass up and you can just throw it at them. It’s a power shared by both incarnations, Bi-Han (now Noob Saibot) and Kuai Liang, and is way more awesome than making the ground a bit slippy, and for that matter, any other ice-powers you care to mention. Have you had the time to cool off, or are you feeling a little cold from all of these puns? Well, Icy that you need to have some time out, so here’s some honourable mentions for this list. These are our picks for honourable; not getting to the main list due to their lack of oomph. More of an object than a move or power, but if we’re discussing icy powers then it’s absolutely worth a nod. At the cost of your memories and sanity, the bearer of the crown of ice created by the first of the Ice Elementals – Urgence Evergreen – gains immortality, and complete access Evergreen’s magical powers. 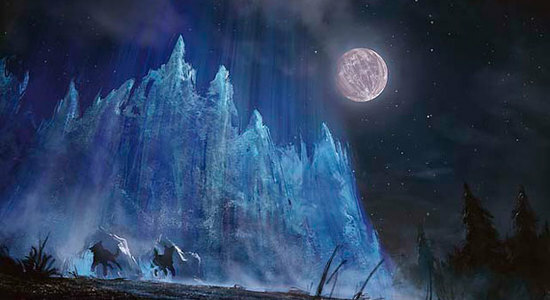 Bolts of ice are the most basic skill, but the icecrown’s powers seem quite limitless, including freezing the entire world for 400 years without the need for a living bearer. Shaping and creating ice into whatever shape is useful to the host is a given, shields and weapons with which the host actually possesses greater ability than with normal weapons, a skill called “Fridjitzu”, weather shaping (although only one type of weather), facial hair based flight, and dominion over the ice-based life that seems to occupy the snowier regions of Ooo. All in all there’s no one power the crown possesses that’s of particular remark, but it is remarkable in itself in how it parasitically dominates its wearer. 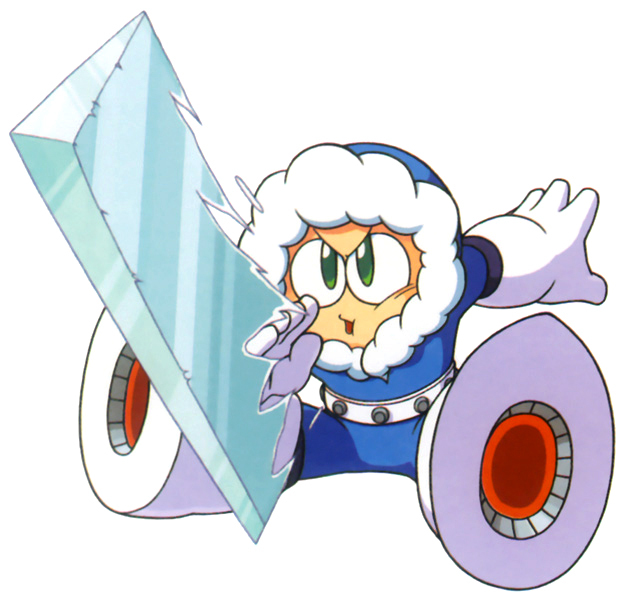 One of the original Robot Masters, Ice Man is one of those bosses that you can’t help but remember from the original Megaman title. However, he wasn’t a final boss or anything; he was just one of the Robot Masters. He was pretty good too – Design wise and ability wise as well. Designed by Dr. Light, he was created for good, until Dr. Wily got ahold of him and the other Robot Masters and reprogrammed him with the intent to take over the world, Pinky. However, Ice Man’s main ability is Ice Slasher, which when used by Iceman takes the form of a large sword made of ice, which is spat from the mouth. On touch, this can freeze anyone. When you defeat him, you acquire this ability, but for Megaman it turns into an arrow head for… reasons? Perhaps more bafflingly is the fact that Ice Man’s Ice Slasher is the most effective move against Fire Man. No, that’s not just some physically fit guy in flame retardant clothing, stop it. Ah, we’re finally sat by the fire now, able to heat back up after this rather frosty reception you’ve given us. I mean, just because we’ve been making ice puns throughout the whole of this list doesn’t mean you should be so cold! Nevertheless, we’re here to do a damn good job of these Top 10’s and so we hope you’ll now pick our next Top 10 which will be ready next Saturday. You might notice a theme with the lists this month! 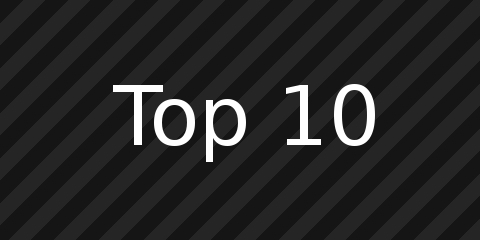 That’s it for this week, hopefully you’re going to stick around through this festive season and let us know what you thought about the above Top 10 list. Do you agree with Sub Zero being our number one choice on this list? For the record, between Joel and Timlah, the choice of Sub Zero was 100% undenied. We could not justify anything else that made our list getting the number one slot, but the Ice Form shout getting number two only made it there through game-breaking comedy. Was that the right move? Let us know what you think in the comments below, or over on Facebook, Twitter or Reddit.